Grasshoppers have a varied diet. In this article you’ll get to know what do grasshoppers like to eat. Some of the grasshoppers are thought to be grass-feeders or forb-eaters, while most are classified as polyphagous or generalists, still others are recognized as specialists (monophagous). 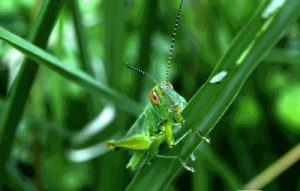 The feeding behavior of grasshoppers entirely depends on their preference for specific foods. Grasshoppers are typically herbivores but many species likely feed on dead grasshoppers. Unlike few, many grasshoppers are polyphagous which means that they rely on several species of plants. The polyphagous grasshoppers’ growth depends on the number of plants they munch on. The greater is the diversity of plants in their diet, the healthier is their growth. 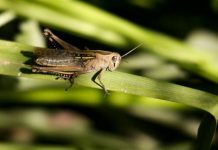 Studies suggest that grasshoppers which have mixed-feeding diet are likely to grow faster and healthier than the specialist feeders. Sometimes however it happens that the plants species occur at a fair distance—thereby forcing grasshoppers to rely on only one or more plants. Grasshoppers generally do not like to fly distances between the plants since it consumes a lot of energy. As it turns out, the generalist feeders become specialist eaters. Lubber grasshoppers consume plants such as cabbage, kale, beans, pea, eggplants, pepper, fennel, tomato, okra, celery, and lettuce. They will also eat cowpeas, corn, peach, figs, citrus, and peanuts. Grasshoppers are pretty selective in their feeding behavior. The hardness of a leaf, its size or even the predation can change the grasshopper’s feeding behavior. They will less likely forage for food. Grasshoppers spend as little energy as they possibly can. The grasshopper’s diet consists of grasses, broadleaf weeds, herbs, broadleaf plants, and pokeweed plants. Grasshoppers will rely on olfactory cues as well as sight to find food sources. They may not eat plants straightaway. Grasshoppers are most likely to test the plant first. Their bite usually relies on inputs from many sensillae which occur at their antennal tip or labial pulp. Studies indicate that the grasshoppers may spend hours whilst feeding on the same plant if they are satisfied with their nutrient quality. But how long does the grasshopper feed on a specific plant doesn’t always depend on one factor. It also depends on the physical properties of the host plant i.e. if the plant is rich in water; if it is hard or what types of chemicals does it seem to possess. The lubber grasshopper (Romalea microptera) is a generalist feeder. It lives in the southeastern United States. The grasshopper appears to rely on a wide variety of plants. Lubber grasshoppers will consume as many as 104 plants which belong to the 38 families. They will like to feed on ornamental plants, vegetables, and foliage of citrus. Lubber grasshoppers prefer to live in oak woods, desert grasslands, and foliage of perennial shrubs. They are thought to eat a wide variety of plants and flowers such as weeds, cotton plants, field edges, and citrus leaves. What Plants Do Grasshoppers Eat? Can you guess what kind of plants do grasshoppers eat? Grasshoppers feed on needle grasses, thorny grasses, Pontederia cordata, Phytolaca americana; tread-softly, arrowhead, Sagittaria spp., and Pontederia cordata; lizard’s tail. They will also eat cowpeas, corn, peach, figs, citrus, and peanuts. But polygynous grasshoppers do not seem to feed on all plants equally likely. That is to say that they will prefer one over the other. Lubbers also consume other plants including cabbage, kale, beans, pea, eggplants, pepper, fennel, tomato, okra, celery, and lettuce. Grasshoppers supplement their diet with Amazon lily and flowers that belong to the family Amaryllidaceae as well as defoliate amaryllis. Favorite among the weeds are Florrida beggarweed, Richardia scabra, Old-world diamond-flower, Cnidoscolus stimulosus, Poinsettia cyathophora, Florida pusley, smooth crabgrass, Digitaria ischaemum, Phyllanthus urinaria, painted leaf, Desmodium tortuosum, Oldenlandia corymbosa, chamber bitter, and tread softly. Hunter-Jones, P. 1967. The life-history of the eastern lubber grasshopper, Romalea microptera (Beauvois), (Orthoptera: Acrididae) under laboratory conditions. Proceedings of the Royal Entomological Society, London (A) 42: 18-24. Watson JR. 1941. Migrations and food preferences of the lubberly locust. Florida Entomologist 24: 40-42. I am a contributing author and co-founder of animalsanswers.com. Every now and then i find myself hooked to my laptop researching and trying to discover new species of animals.